Holly Madison is generally a pretty busy lady. However, the soon-to-be mother recently quit her Las Vegas program, Peep Show, handing over the reigns to Coco Austin as her due date approaches. This means she has a little time on her hands, and she is using that time to go to Walt Disney World. When a woman is pregnant, she will undoubtedly start thinking along more child-oriented lines, and in this case, Madison has taken the magic a step further. Orlando’s Walt Disney World resort is a great place to relax (and also find great inspiration for cute children’s outfits). 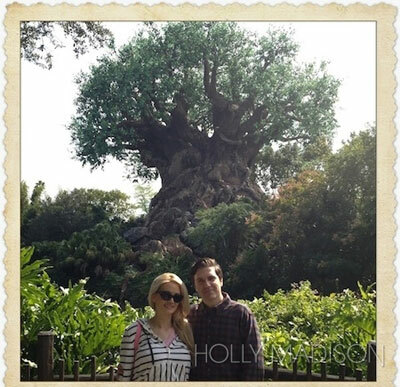 According to Madison’s blog, during the trip, the couple stayed at Disney’s Animal Kingdom Lodge, eating at restaurants in the resort and spending time in the parks. While Madison marveled at the giraffe’s outside of she and boyfriend Pasquale Rotella’s room, I’m marveling at the care the staff took with couple’s ‘babymoon.’ They received uniquely folded towels with cute little animals attached, and, according to photos on the website, they were even given notes of congratulations from the staff. This may be the sort of thing the Disney resort only does for celebrities, but it’s a genius idea, and if they do the whole ‘babymoon’ thing for any pregnant guests who request it, it’s a great business model. I may be a sucker for Disney World, but I would totally be down with that sort of nonsense. Madison and Rotella are expecting a baby girl in March.